When it comes to bagels, New Yorkers can be pretty particular. From hand-rolled, kettle-boiled classics to wood-fired hybrids, there's something for everyone. 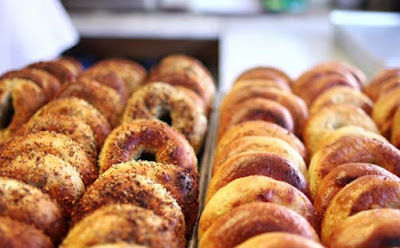 Zagat, the publisher of restaurant guides and reviews, visited three of New York's beloved bagel shops — Kossar's Bagels and Bialys, Black Seed Bagels and Zucker's Bagels and Smoked Fish — to find out which version their editors enjoyed the most. In this video, the Zagat reporters show the differences in production of bialys, Montreal style bagels, and New York style bagels, and analyze the results. After viewing, it, you'll find it hard to resist a trip to the local bagel bakery and loading up your favorite with some lox and a schmear.